As announced by the United Nations, 21 April 2019 will be another “World Creativity and Innovation Day”. A day to remind people and organisations that without creating and ideating new things every now and then, we would probably go insane. Furthermore, without a certain amount of creative work in your job, your position will most likely become automated in the near future. Alternatively, you could get stuck in a job doing the exact same thing over and over again, making you feel like a robot yourself. For the individual, being creative is an important aspect of work, because creativity triggers our brain and stimulates self-expression. Indeed, it’s equally important for the company. Think of a business that you would consider to be successful. The first business that comes to mind most likely knew how to differentiate itself by coming up with a unique concept or idea. However, ‘creativity’ is quite a broad concept, especially in the workplace. Being creative can mean something completely different to a hair stylist than to a web developer. It all depends on how an individual stimulates their own mind to come up with something original that benefits their work, their team, or possibly their entire organisation. We were curious about how creativity is perceived and deployed in our workplace, so who better to ask than our own employees? 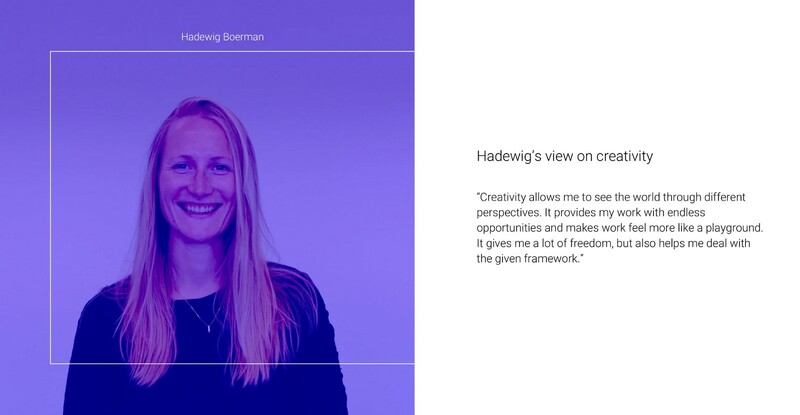 Today, Hadewig shares her views on creativity in her daily work! We hoped you enjoyed our first interview! Like and share the post if you believe Hadewig’s perspective on creativity is worth the read for others as well. Keep updated for more interviews the upcoming days!